Shirts With Random Triangles: Butch Jones says Tennessee football seeks recruits with "a five-star heart." Butch Jones says Tennessee football seeks recruits with "a five-star heart." Butch Jones. Image via Bleacher Report. 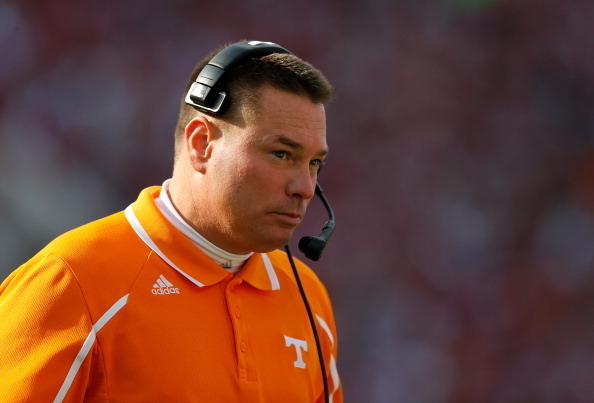 Tennessee head coach Butch Jones is heading back into Derek Dooley territory again. Having already given the 2016 Volunteer football team "The Championship of Life," Jones has now blessed us with this lovely quotation about what he seeks in a recruiting prospect. “We’ve spoken about the competitive nature, and I think that’s really, really big in today’s world,” Jones said. Everyone gets into the whole two-star, three-star, four-star, five-star thing. The only five-star that we even concern ourselves with is a five-star heart. While seeking players with "five-star hearts" may be a beautiful notion, it didn't help the Vols in either beating Alabama or winning the SEC East in 2016. It did, however, place Jones on the five-star hot seat.